Made fresh daily, our entrees are ready to takeaway. Hot or cold. Our frozen entrees are in single serve portions, made to easily warm up at home. HOLY COW, THIS IS AMAZING TAKEAWAY! The Cow is viewed as sacred in most parts of India. It is customary in many parts of India to honour the Cow and therefore not eat beef. 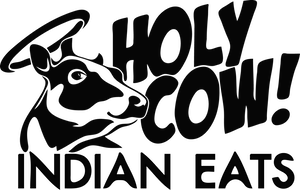 In North America, however, the expression "Holy Cow" is an exclamation of surprise! We're a BOSCH kitchen centre outlet! Visit our shop for kitchen gadgets and small appliances. We carry organic spices, Indian spices and groceries to help you nourish your body. Visit our shop to see our full selection.